Like Casey and Jessie, author Lesléa Newman loves shimmery, glittery, sparkly things! Casey’s big sister Jessie has a shimmery skirt, glittery nails, and a sparkly bracelet. Casey wants these things too, but Jessie thinks they are only for girls. Or are they? Sparkle Boy is a gentle book about acceptance, respect, and everyone’s right to shine. Shimmery, glittery, sparkly things are fun…..for everyone! Here’s a question I was once asked: “If you had nothing to rebel against and nothing to conform to, who would you be?” That got me thinking about the “rules” that our society dictates that are harmful to us all, including notions about gender. 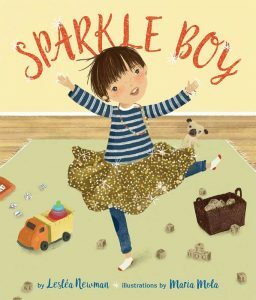 I wrote Sparkle Boy in hopes that it will add to the discussion about the wide spectrum of gender expression. There is no “right” way to be. There are as many ways to express gender as there are people in the world and we all deserve the freedom to be whoever we want. 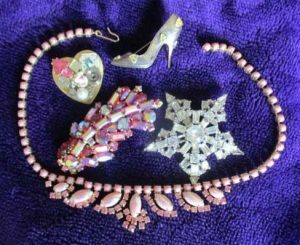 Jessie adored all things shimmery, glittery, and sparkly. “Look at my shimmery skirt,” Jessie said to her little brother Casey as she twirled into the living room and her skirt twirled out all around her. Jessie stopped twirling and her skirt stopped twirling, too. “You can’t have a shimmery skirt, Casey,” she said. Mama thought for a minute…..